First, the disclaimer. I’m not a lawyer and don’t even play one on TV. This isn’t legal advice. It’s a common misconception that just because something is on the Internet, it’s “free” and you can do whatever you want with it. Just because the Internet makes it easy to steal copyrighted photos, videos, sound clips, songs, writings, etc. doesn’t mean that it’s OK to do so. When it comes to photos, unless you took it yourself, for your own use, on your own time, you probably don’t own the copyright and shouldn’t use the photo in your marketing materials. If you didn’t get a “model release” from any live, recognizable humans appearing in it, you probably shouldn’t use it in your marketing materials. One of the most important aspects of Wikipedia is that its text…may be freely redistributed, reused and built upon by anyone, under the terms of the Creative Commons Attribution-Sharealike 3.0 Unported License (CC-BY-SA) and, except where otherwise noted, the GNU Free Documentation License (GFDL)…Contributors agree to release their original content under both licenses when they submit it, and material from public domain sources or other compatibly licensed sources may also be used in accordance with [Wikipedia’s] copyright policy, provided correct attribution is given. When is it OK to use an image in your marketing materials? You own the copyright because you created the work yourself, for your own use (not for hire by someone else). You hired a photographer to take the photo and your contract includes the transfer of the copyright to you upon payment. You paid the copyright owner a license fee and you are using the work according to that licensing agreement. You paid the copyright owner’s agent or agency (such as one of my favorite stock photo sites, BigStockPhoto.com) a licensing fee and you are using the work according to that licensing agreement. The copyright owner has published the work under a “Creative Commons” license or a similar agreement that allows others to use and/or modify the work without payment under certain conditions and you are using the work in accordance with that licensing agreement. Doesn’t “Royalty Free” mean you can use an image without paying for it? You’ve probably heard of royalties. An author may get a royalty every time her book is printed, or a musician may get a royalty every time his song is performed on the radio. When it comes to images, “royalty free” is not the same as “public domain” or “free to use under any circumstances.” A royalty is a payment made by the user of a copyrighted work (the “licensee”) to the owner of the copyrighted work (the “licensor”) for the right to use the work on an ongoing or repeated basis. For example, in the world of illustration, a rights-managed image license might require that you pay a cent for every impression of a 2,000-piece print job, or make a payment for every time the image is published on a t-shirt. In contrast, a “royalty free” license allows you to use an image as many times as you like, in several different projects, after making a one-time licensing payment. So, where can you find images that I can use for free in my marketing materials without violating the owner’s copyright? You can use Google Images search to find images that may be in the public domain or available to use under Creative Commons licensing. 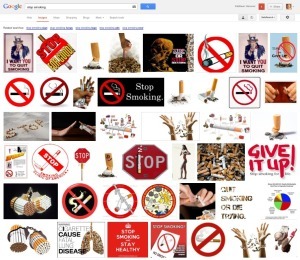 Go to Google>Images and type your search words in the box, then search. On the results page, all the way over to the right, click on the gear symbol and choose Advanced Search from the drop-down. Click “Advanced Search” to perform the search. 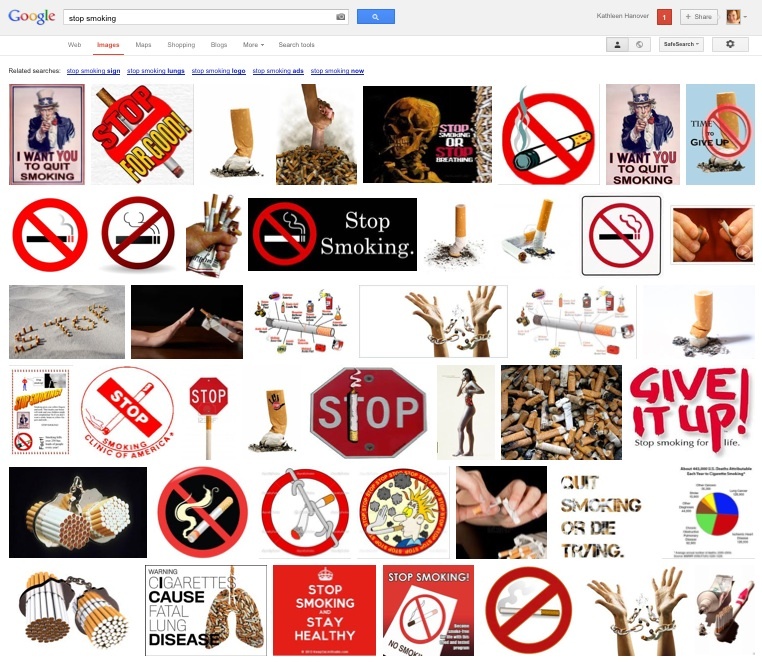 Check out these images to see the difference between an unfiltered search for “stop smoking” images and a search that is restricted to images that can be used, shared or modified, even commercially. 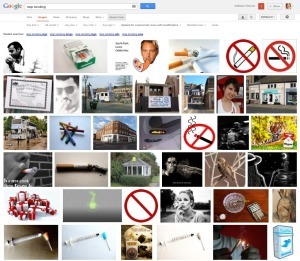 You can take your chances with Google Images, or you can restrict your image browsing to a site where everything is available for your commercial use free of charge. Many thanks to the hardworking volunteer contributors on Wikipedia who have assembled a massive list of public domain image sources and resources here. Keep in mind, though, if a “public domain” photo contains a close-up image of a living person who has not signed a model release, it’s probably a better idea to use a royalty-free stock image to ensure that you’re not violating someone’s privacy. It’s good form to attribute images to the photographer or source if you can, even if they’re in the public domain. Many Creative Commons licenses require attribution as part of the licensing agreement. Here’s a photo from the USDA Natural Resources Conservation Service, a taxpayer-funded government agency. Because We The People paid the photographer who took this image, it’s in the public domain and can be used without payment. USDA NRCS has helpfully done the hard work of getting model releases from their subjects, so we don’t have to. 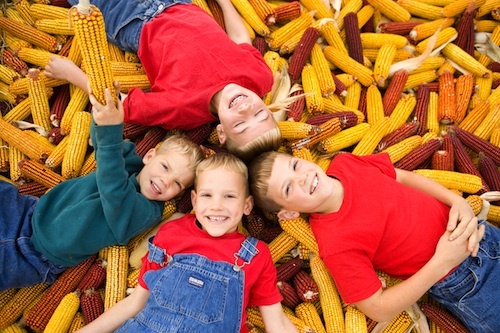 Kids lying on a bed of organic feed corn on a farm in Ohio. Photo by Scott Bauer, USDA Natural Resources Conservation Service. Photo by (photographer’s name), USDA Natural Resources Conservation Service. It’s so easy to find free photos online. Great images for your website or blog posts don’t have to cost an arm and a leg…but a copyright infringement lawsuit might. Take a minute to confirm that an image is really “free to use” before you find out—the hard way—that it’s copyrighted intellectual property.